You can listen to 'Lalalalala' here. Reading the first descriptions of Rats on Rafts' music early last year, I had already made up my mind. Early 80s punk and new wave. I'd heard enough before I heard any music by the band. And here I'm writing a review any way. The reason behind all this is that early 80s new wave made me turn away from modern music for about ten years. The dry, harsh or doom and gloom sounds of bands like Gang of Four, Comsat Angels, Joy Division, Depeche Mode et al was just not for me. And they still aren't my cup of tea. Fact is that with the debut album of Franz Ferdinand (my apologies to over-sensitive WoNo Magazine readers for using the FF word!) my take on the modern version of punk funk has altered considerably. So, here I am with The moon is big. Let me start off with the fun cover of the cd. A band that depicts a halved melon for the moon deserves a listen. So I did and I've enjoyed myself from the very first start. 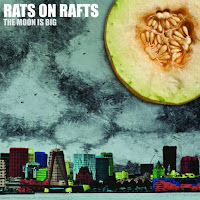 Although the sound is familiar, dry and spacey in a noisy way, Rats on Rafts throws some lightness into its mix. The moment the saxophone enters 'Patient' the mood is altered. The same goes for a light toned guitar in 'Plaster plaster' or the "aaaah aaaah" harmonies in 'Lalalala'. 'God is dead' shows some influences that go way beyond 1980. The intro sounds like a bootleg of The Velvet Undergrounds and then we skip 14 years and hear a very well played punk song like The Undertones or The Jam. By having a school choir chant the title of this song Rats on Rafts show their take on humour in music as well. By then Rats on Rafts have divulged that not all is in doom and gloom what happened musically around 1980. The band members may have paid a lot of attention to the record collection of their parents, but obviously also at that of aunts and uncles'. There's musically enough in here to interest anyone with a keen ear for musical adventure. Rats on Rafts to me seems more influenced by sound than by song. There's more variety in these nine songs than in the total discography of Joy Division and Gang of Four put together. A slow easy song like 'Sleeping in Rotterdam', home town of the band, is an example of this, where some The Stone Roses seeps through. The title of the last song, 'Jazz' seems to take the band in a completely different direction, but doesn't really, although it does in spirit. Behind a bit hasty rhythm a great song shows itself and as far as I'm concerned the pearl of The moon is big. There's changes in mood, pace, attack and a good melody as well. New wave, punk, a stripped down version of The Who? Who cares, 'Jazz' is great fun. All in all The moon is big will not be my favourite album of all time, but is fun, varied and true sounding. Definitely time to make a live acquaintance in 2013.